Since his last full-length, Ode, Tin Man, AKA Johannes Auvinen, has taken a collaborative approach to acid, bringing his 303 box into studio scenarios with Cassegrain, John Tejada, AAAA and Gunnar Haslam in order to explore new territory. 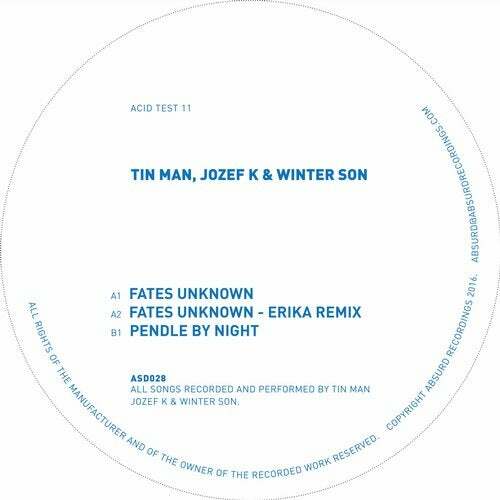 On Acid Test 11, Auvinen's arrived on a seamless pairing with Manchester production duo Jozef K and Winter Son. On the title track, Tin Man's acrobatic 303 no longer has to do the melodic heavy liftingthe Mancunians provide a sturdy yet plaintive piano base that allows a duet of acid lines to cut through the heady atmosphere. Interdimensional Transmissions boss Erika toughens things up considerably with her "Fate's Unknown" remix, stripping things back to a creepy, jacking core. "Pendle By Night" underlines the ad hoc trio's propensity for widescreen heft. The track's epic, emotional tone feels like a natural product of the collaboration.